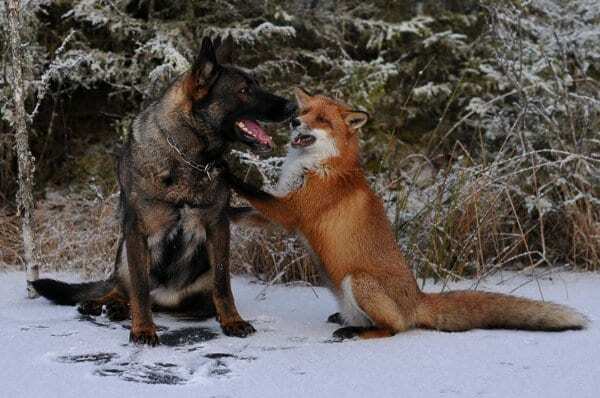 We’ve all seen the nature shows where all of the animals fight against each other for dominance in the animal kingdom. It sure must be chaotic and frightening in that cold, dark, friendless world. But maybe not all is as it seems to us. 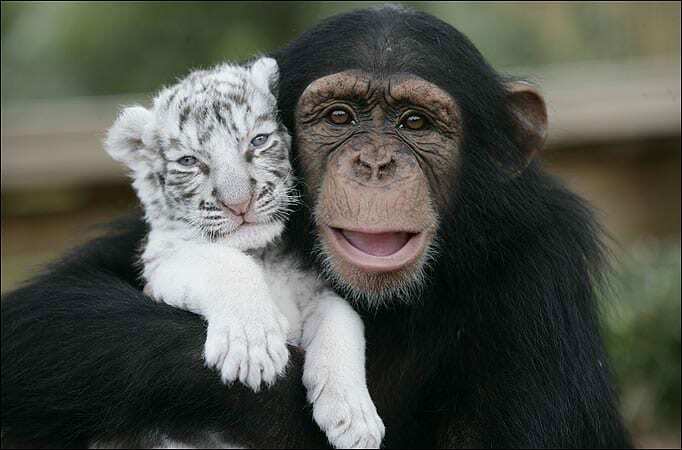 Sometimes animals from different species, and even different parts of the food chain, become best friends. Here are five beautiful times that happened! These two fellas grew up together at Bucsh Gardens amusement park in Tampa Bay, Florida. It was always such a thrill for the park’s guests to see these two playing together in the safari area, and the two quickly became famous. However, just like with humans, Mtani and Kasi grew up, and now Mtani is more interested in female cheetahs and tail of another variety. However, the two still hang out together and are taken on visits to schools to show the kids there how everyone can get along! These two cubs were born in South Carolina during Hurricane Hannah, but their enclosure was flooded and they had to be moved. That’s when something incredible happened. The cubs, whose mother was too stressed to take care of them, were given to animal caretaker China York. Incredibly, her chimp companion Anjana really connected to the cubs, and became one of their primary caretakers, helping to play and feed the cubs! Maybe chimps are more like us than we ever thought. When little Dennis’s mom was eaten by a fox, things weren’t looking up for the little duckling who was left for dead. Luckily, Fred smelled something and raced over to the little injured duckling, immediately starting to lick him. 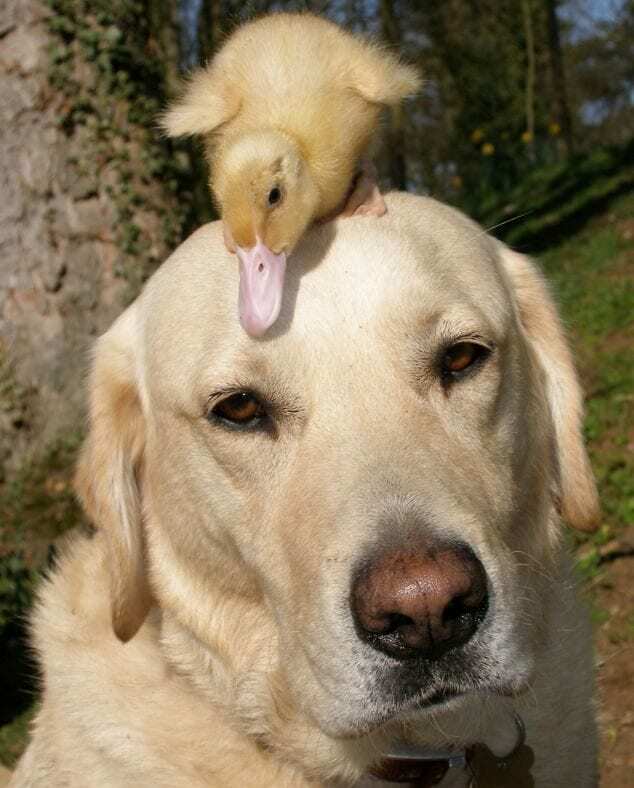 Fred’s owner Jeffrey knew he had to take the little guy home, and Fred and Dennis have been inseparable ever since. This big dog with an even bigger heart is already a pro at adopting small helpless animals and nursing them back to health, having already done it with a injured foal! Norwegian photographer Torgeir Berge and his dog Tinni live at the edge of a forest, and one day, a Disney movie literally came to life in his backyard. A fox came into the backyard and instead of chasing him off, Tinni started playing with him! 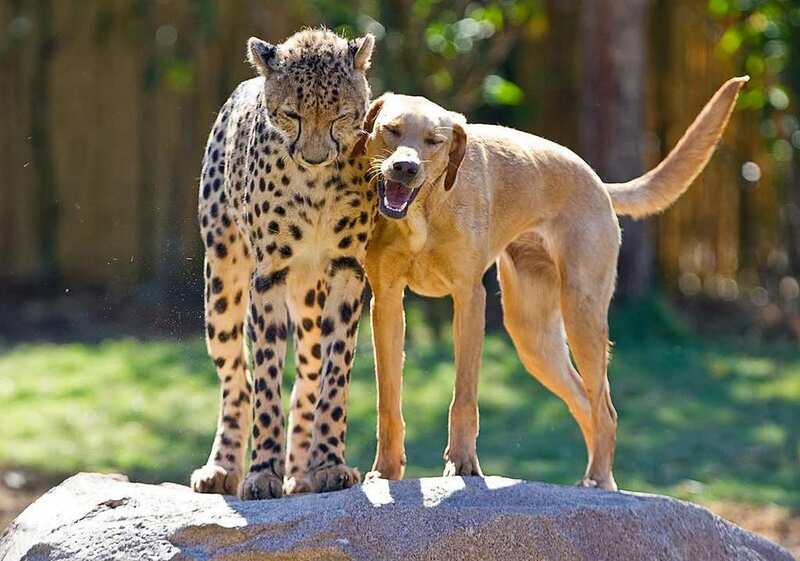 The two have since become inseparable best friends, romping around in the forest every day. Good thing for us that Berge is able to take such amazing pictures of the adorable duo! When the British Tate family dog had a litter of puppies no one expected that the family hen would become so attached to them. 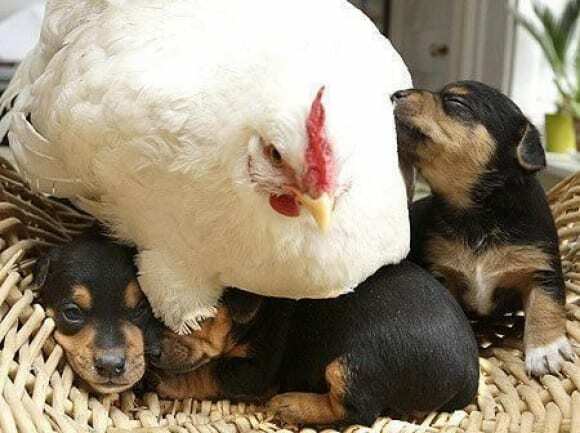 But a few days after being born, this hen took the chance to jump into the puppies’ basket to keep them warm while the mother was outside for a break from taking care of her litter. What lucky pups to have two different moms looking after them!